Introduced in 1892 by D.M Ferry Co. this variety has grown in popularity ever since. A heavy producer of sweet, tender pods that are eaten whole. 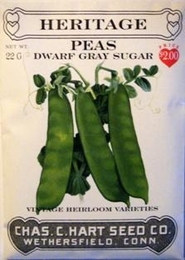 Dwarf Gray Sugar pea vines grow 24 to 30 inches tall and do not require brush or staking. Plant in double rows 6 inches apart for additional support. For best flavor, pick pods when quite young and almost flat. Plant peas every 2 weeks for a continuous supply. Plant seed outdoors early in season (March in New England) whenever weather allows. Plant seed 1 1/2 inch apart in rows spaced 2 1/2 feet apart. Cover seed with 1/2 inch of fine soil, well pressed down. Germinates in 10-14 days depending on weather conditions. Bulk Heirloom Peas seed available. 120lbs of Heirloom Peas seed needed per acre.